Christie’s New York will hold its last wine auctions of the 2014 on December 12 and 13 with nearly 1300 lots of the most unique ranges of the finest and rare wines featuring The Connoisseur Collection: A Peerless Offering of Fine Wines featuring Domaine Méo-Camuzet. Together, the two auctions are expected to exceed US$ 3 million. Christie’s is proud to have been entrusted with an extraordinary collection of Masseto, which will offer collectors an extremely unique opportunity to access one of the world’s most singular expressions of Merlot. The present offering showcases examples in rarely seen size formats, ranging from bottles through to a limited release to 15 liter Nebuchadnezzar. 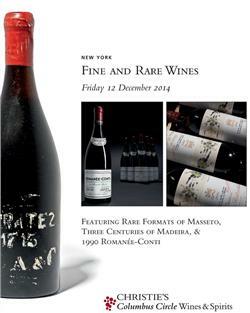 This is the first time Masseto has offered library stock, directly from their cellars, for auction in North America. To honor this release, Christie’s has created individual Library Release stickers for every bottle. The bottles have traveled directly from Tuscany to New York and the collection represents one of the most impressive offerings of Masseto to be seen at auction in recent years. The final installment from a collector who has sold wine with Christie’s since late 1999 whose present offerings are led by a Domaine de la Romanée-Conti, Romanée-Conti 1990 (6 bottles per lot; Estimate: $100,000 – $150,000). Close to 100 lots of four of the First Growths of Médoc, all from recent vintages, that were purchased as futures and have been stored in commercial storage since their arrival to the United States. On Saturday, December 13, Christie’s will have the pleasure of offering a private collection of treasured wines from all of the top regions in the world sure to entice every type of wine collector. The sale brings forth Lafite-Rothschild 2000, in regular bottles, magnums, double-magnums, and imperial with even more sizeable lots such as two Nebuchadnezzar’s (15 liters) of Lynch-Bages from 1985 and 1986. Furthermore, Latour, Mouton-Rothschild, Margaux, Pichon-Lalande, Palmer, and La Mission-Haut Brion are all represented. To round out this offering is an impressive selection of wines from Domaine Méo-Camuzet – an unparalleled selection of every Cru this legendary domaine produces, including multiple vintages of rarely seen Richebourg and au Cros Parantonux. Highlights include Cortons, Premiers Crus from Nuits St. Georges and Vosne-Romanée. FINE AND RARE WINES FEATURING RARE FORMATS OF MASSETO, THREE CENTURIES OF MADEIRA, AND 1990 ROMANÉE-CONTI, click here. THE CONNOISSEUR COLLECTION: A PEERLESS OFFERING OF FINE WINES FEATURING DOMAINE MÉO-CAMUZET, click here. Christie’s, the world’s leading art business, had global auction and private sales in the first half of 2014 that totaled £2.69 / $4.47 billion, making it the highest half year total in Christie’s history. Christie’s is a name and place that speaks of extraordinary art, unparalleled service and expertise, as well as international glamour. Founded in 1766 by James Christie, Christie’s has since conducted the greatest and most celebrated auctions through the centuries providing a popular showcase for the unique and the beautiful. Christie’s offers around 450 auctions annually in over 80 categories, including all areas of fine and decorative arts, jewellery, photographs, collectibles, wine, and more. Prices range from $200 to over $100 million. Christie’s also has a long and successful history conducting private sales for its clients in all categories, with emphasis on Post-War & Contemporary, Impressionist & Modern, Old Masters and Jewellery. Private sales in the first half of 2014 totalled £498.9 million ($828.2 million). Christie’s has a global presence with 53 offices in 32 countries and 12 salerooms around the world including in London, New York, Paris, Geneva, Milan, Amsterdam, Dubai, Zürich, Hong Kong, Shanghai, and Mumbai. More recently, Christie’s has led the market with expanded initiatives in growth markets such as Russia, China, India and the United Arab Emirates, with successful sales and exhibitions in Beijing, Mumbai and Dubai. Complete catalogue available online at www.christies.com or via Christie’s Mobile, iPhone, iPad and Android apps.